After a quick bite and drink at Compere Lapin, we continued the street to Cochon. I was going to check out the more casual Cochon Butcher but it was packed and we didn’t really want to eat outside (it was extremely hot and humid that day). So we rounded the corner to Cochon and discovered seats at the bar. I got the Brainiac which seemed brunchy to start. 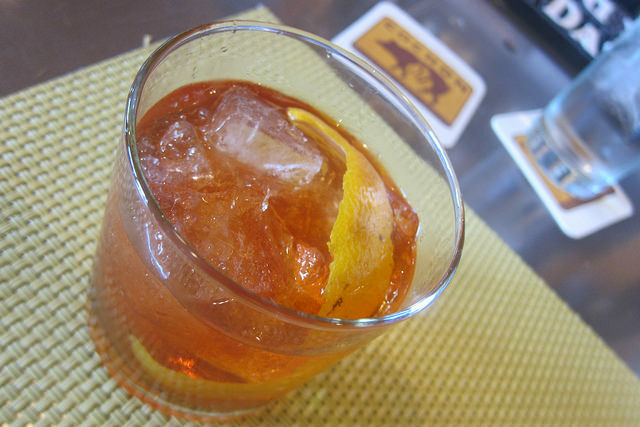 It made me think of an old fashioned or Boulevardier. I firmly believe whiskey based drinks are good brunch/ daytime drinks. I’m generally more of a Campari fan over Aperol but it worked in this drink, especially balanced out with the hopped grapefruit bitters. 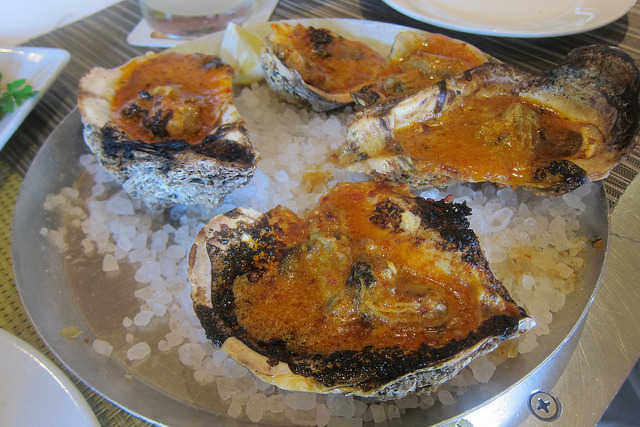 The wood-fired oysters with chili garlic butter were really great. I like raw oysters but I really enjoy them more when they’re cooked. There’s something about the texture of cooked oysters that is more interesting to me. It’s so great to have friends who like liver. 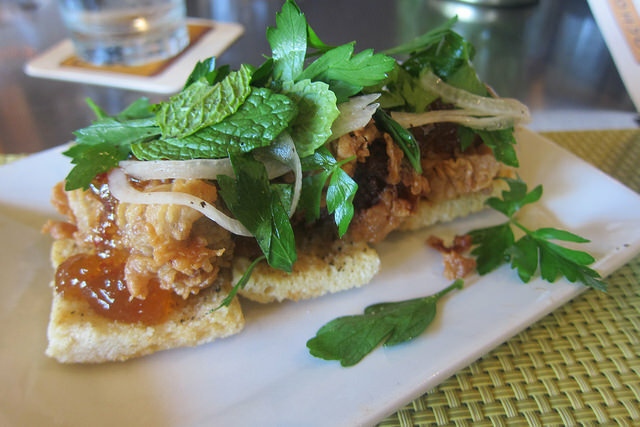 When we looked over the menu, we both wanted the fried livers with pepper jelly and toast. 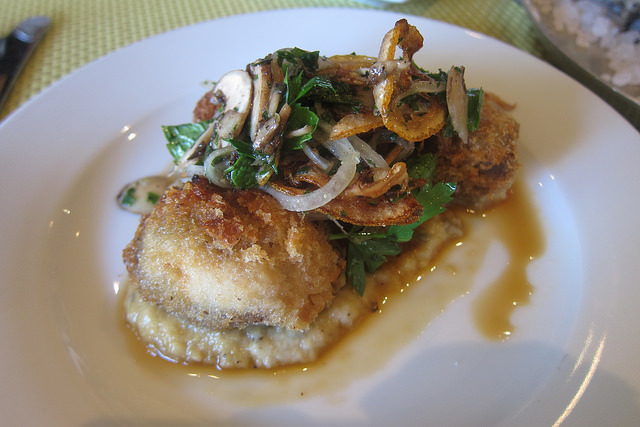 I liked all the herbs on this dish because it balanced out the fried livers. Plus I’m a huge mint and Italian parsley fan. We loved the pork cheeks. I really enjoyed the eggplant caviar it came on. The pork was super tender. Did I order the gumbo? Of course I did. 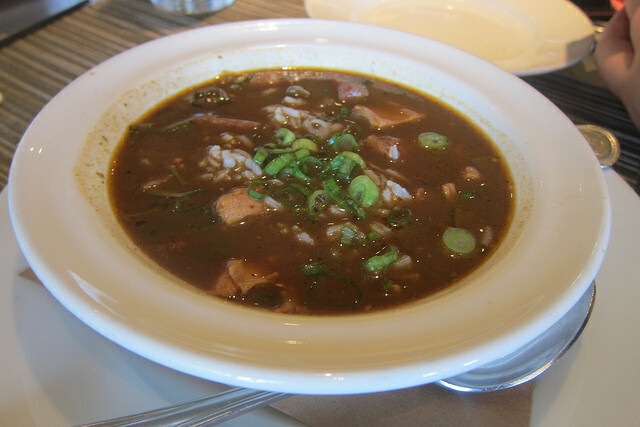 Cochon’s version was a thinner broth. I figure it was a roux based gumbo but the almost medicinal flavor made me wonder if this was in fact thickened with file powder (powdered sassafras leaves). In any case, my friend didn’t like it while I found it really cool to compare all the gumbos I’ve been having all weekend. We probably would have ordered an entree and dessert but we got really full quickly. The oyster and bacon sandwich sounded really good. I did think about more appetizers. The shaved pig’s head salad also looked great. I probably would have gotten the grilled okra with black barley as well.